The hotels below are part of the accommodation that feature on our Ultimate French Wine Tour multi-region package. These hotels all boast immaculate and chic décor, complimented by exceptional customer service. They have therefore been selected as part of our Elegant range. 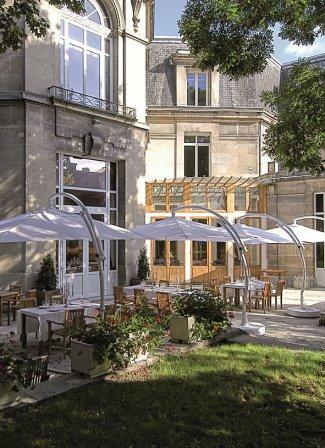 Hotel de Sèze is comprised of three historical buildings which have welcomed guests since 1927. Following a dramatic renovation from top to bottom, the hotel was reopened at the end of 2012 as a sumptuous 4* establishment. Inspired by the flamboyance of the 18th century, the 55 rooms follow various unique themes and combine leather and suede furnishings with antique-style paintings and wallpaper. Of the 55 rooms, Grape Escapes guests stay in Classic rooms and these are each equipped with air-conditioning, a private safe, mini-bar and en suite facilities. 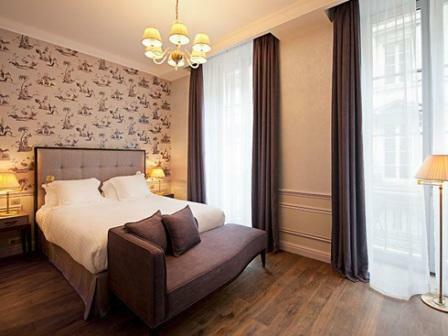 The Oceania l’Univers is a five-floor hotel dating from 1846. The 85 guestrooms are each decorated in contemporary bright colours with fresh wooden flooring and include satellite television, direct-dial telephones, mini-bars and free wireless Internet connection. Bathrooms are equipped with shower/bath combinations, telephones, hair dryers and premium toiletries. Guests can relax on leather sofas in the atrium-style lounge area and browse through the portraits of the hotel’s famous visitors. French gourmet food is served in the restaurant and the lounge bar serves Champagne and a selection of malt whiskies and cocktails. 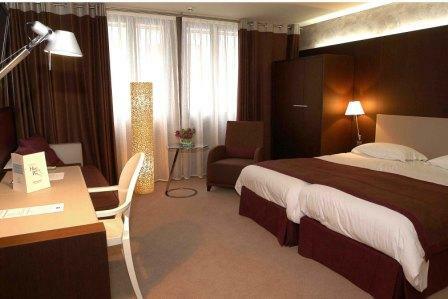 The Hôtel de la Paix is a modern, elegant hotel situated in the city’s historic centre. With 177 rooms, the hotel is able to offer a wide range of amenities including a brasserie specialising in sea food, a small indoor pool, a fitness room, sauna, steam room and a Jacuzzi. The Tradition rooms provide all of the usual amenities offered in a modern 4* hotel, including en-suite bathroom, mini-bar, satellite TV and direct dial telephone. 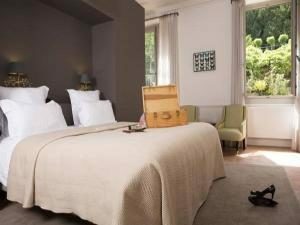 In addition to the Tradition rooms, the hotel offers large Privilège rooms and Deluxe rooms – the latter are effectively Junior Suites offering plenty of space to relax and unwind. As with the rest of the hotel, all bedrooms are air-conditioned. Located in the heart of historic Strasbourg, on the banks of the River Ill, Hotel Regent Petite France is 300 years old but decorated in an exceptionally contemporary style. 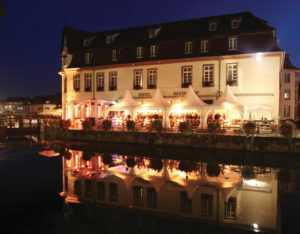 Each of the Hotel’s 72 rooms have been decorated to a very high standard, and all rooms offer guests fantastic views over the River Ill or the traditional Alsatian rooftops. This luxury hotel is located in a tranquil setting whilst remaining close to the town centre and boasts a gastronomic restaurant, a cosy lounge bar with an open fire and piano, as well as a sauna and free WIFI. Each of the 40 rooms are individually decorated in modern yet classic styles. 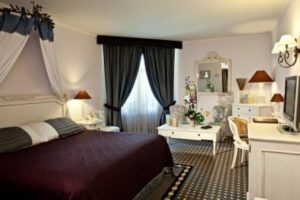 Grape Escapes guests will be staying in Superior rooms, which are spacious and elegant with en suite facilities, a separate toilet, air-conditioning, a large bed, a hair-dryer, mini-bar and a flat-screen television with international channels. Lovers of History will particularly appreciate this private mansion, which over the past four Centuries has witnessed the birth of a literary figure, hosted celebrities in Art and Politics and has established itself as a living heritage in the town of Tournon-Sur-Rhône. Inspired by the 18th Century, the décor is a subtle blend of tradition and modernity, where comfort meets pleasure and relaxation. The elegance and refinement of the hotel can be felt through its furnishings, for example the authentic mantlepieces, the stone stairway with its wrought iron banister and the walnut front door- parts of the hotel are actually classified as historical monuments. This 4* hotel is comprised of a 16th century building and a modern wing. 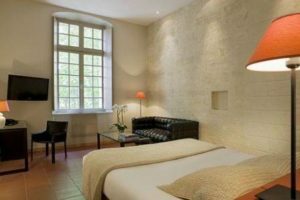 The skilled renovation of this hotel has resulted in modern facilities set against an ancient backdrop. 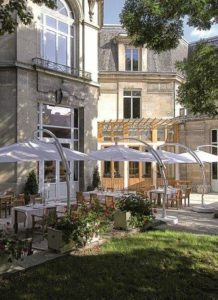 The restaurant serves elegant French cuisine and the hotel also offers a terrace, solarium, an outdoor swimming pool and a unique, charming chapel. The Superior rooms are spacious and modern and Exclusive rooms are also available. These are located in the older part of the building and have separate lounges with views over the cloisters.